Thiruvathirai to commemorate the birthday of Lord Shiva. (All about Thiruvthirai). Tamilians (Iyers, especially) celebrate Thiruvathirai. It is alsoc alled ArdhraDarshanam . http://www.geocities.com/shivaperuman/aruthra.html. Arudra Darisanam, a festival dedicated to Lord Nataraja, is major event in the Shiva temples in Tamil Nadu. This festival is observed during the full moon night in the Tamil month of Margazhi (December).This is a grand festival in which abhisheks are offered to Lord Nataraja and Sivakami, his consort. The rituals are held in the pre-dawn hours, when the moon is still shining brightly. Various ceremonies are held amid the holy chants in Sanskrit and Tamil. A grand procession is later taken through the streets. 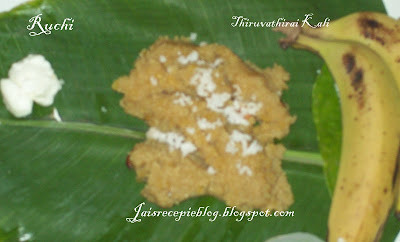 THIRUVATHIRAI KALI (MASHED FLOUR): Cendanar of Naukoor, a disciple of Paddinattu Adigal, used to eat only after feeding some Saiva devotees. Due to a constant bad weather he could not get together all the essentials for a proper meal. He had no option but to mix water with flour and prepare a mashed paste. Lord Siva understood his predicament. He wanted the people to know how sincere his devotee was to him. Therefore he disguised himself as a Siva devotee and visited Cendanar’s hut and enjoyed what was given to him as food. The temple attendants saw the premises scattered with the mashed paste the following morning. Inquiries led to an understanding of Cendanar’s piety and he was thereafter bestowed with all due respect. This incident took place in a Markali Thiruvathirai. This is why Thiruvathirai Kali forms an important prasad on this holy day. Soak and Wash the rice in water for an hour. Drain well . Dry fry in a Kadai on low flame, continuously stirring. The rice grains would turn reddish brown (don’t burn them please!!) ; now remove from fire and blend in the mixi to a coarse powder. Roast the Moong dal to a light brown color. Half cook the roasted dal. Melt the jaggery in 3 cups of water and strain to remove dirt and sand particles. In a large thick bottomed kadai pour the melted and strained jaggery and boil. Lower the flame and slide in exactly one cup of the powdered rice little by little and keep stirring. Make the flame real low and close the kadai. Open the lid after a while and stir well. You’ll find that the KaLi has turned out to look like soft powdery dish. Remove from fire. Add the cardamom powder and mix well. Fry the cashew nut pieces in the rest of the ghee The kali should have a shining surface when done. to eat with a sweet floury dish and two, you don't add dal (cooked lentils) in this curry. Now the following are actual measures for the 2 quart mixture. 1.Roast all of this up on medium low heat, and grind together in the spice grinder. Keep aside. 2.Slice all the vegetables, as for sambar. Add water and boil with salt and turmeric powder. 3.To this add a a 1/4 inch ball of tamarind, that has been soaked in hot water and strained. add the tamarind juice in the vegetables. 4.Once the vegetables are cooked Add the grinded mixture allow to boil Let the vegetables cook and get soft. 5. Keep a large kadai on the oven and add three or four teaspoons of Coconut oil. Add the mustard seeds and after they splutter completely, add the curry leaves and pour the boiled vegetables and stir and remove from fire. The curry is ready. Thank u all for lovely comments..
Looks delicious! I too made that! 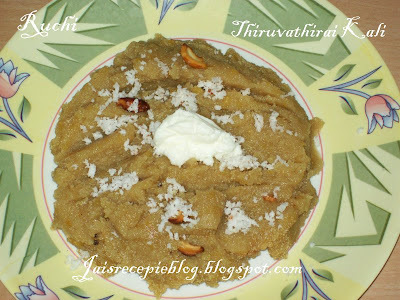 Now i miss my mom's thiruvadhirai kali. 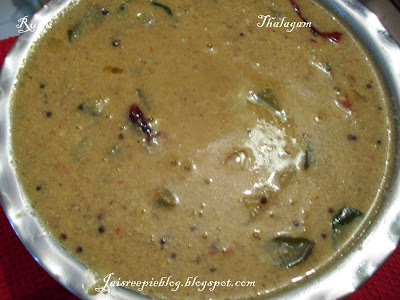 i've never tried it though :) Thalagam is something new. Thank u srilekha,Anu sriram, Anu divya, gita,vibass & rathna..for lovely comments.